Ahhh…the sunroom. It sounds like such a relaxing, lovely room in a house. When we bought our house in Cumberland and I told people it had a sunroom they usually reacted with something to the effect of – “Really? Wow – I’m jealous!” Until they actually saw it, that is. 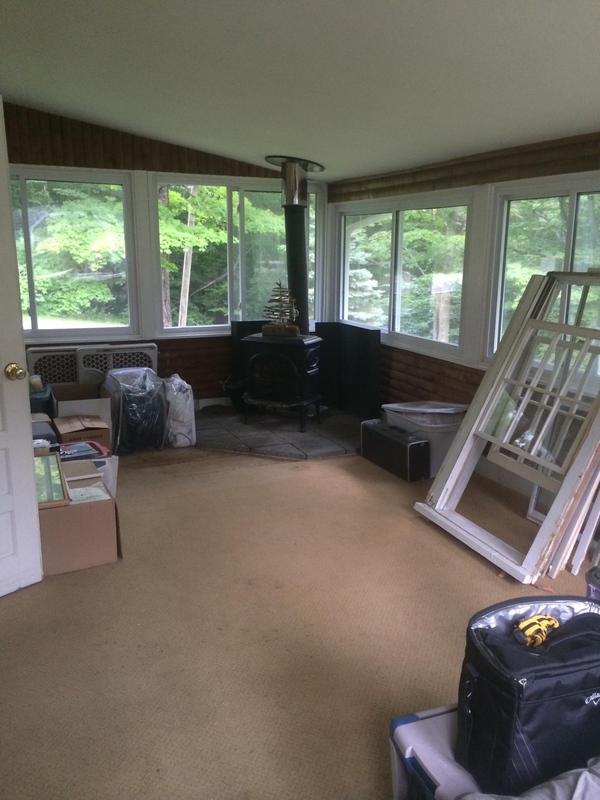 The sunroom is where the previous owner housed his chickens when it was too cold outside. Um, yea – I know. Just don’t ask. The chickens must have done a number on the rug, so the previous owner was kind enough to pull a quarter of it up, leaving exposed subfloor in the corner. So lovely. But like every other hidden gem in this house, we knew with a little blood, sweat and $$$ we could turn it into the rustic, cozy sunroom it was meant to be. I knew exactly where I could find some blood and sweat (love you, babe!) but the money was a little trickier. Luckily, in addition to the 26 empty paint cans and rusty scrap metal in the basement, the previous owners also left behind an oversized commercial freezer in excellent working condition. Onto Craigslist it went, and as luck would have it, a hunter the next town over had just shot a deer and had nowhere to store it. Two hours later he showed up with a pickup truck and cold hard cash – and Dan and I were off to Lowes for a new floor. Three days later, a new sunroom. 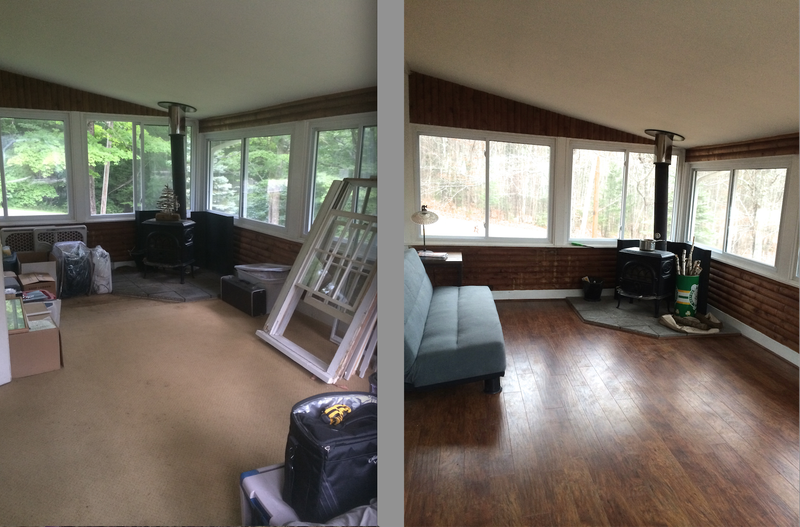 Doesn’t new flooring (and some serious de-cluttering) make a world of difference?! 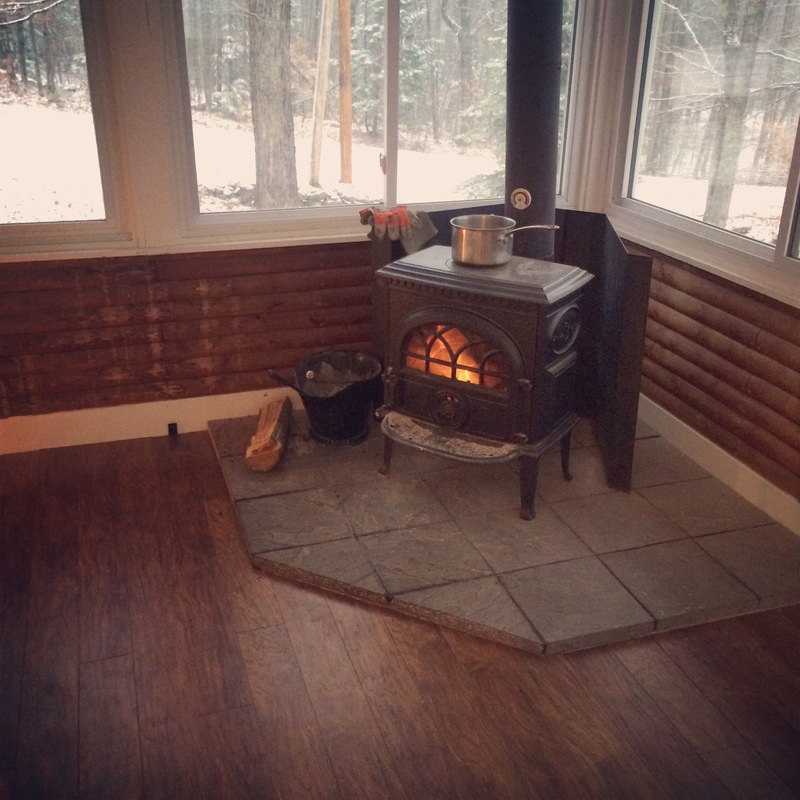 A fresh blanket of snow and a warm fire certainly don’t hurt either. So….whatta ya think? A little closer to lovely?